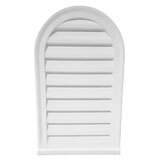 Cathedral louvers available as architecturally decorative louvers or with screening to allow for functionality and ventilation. Louver Overall Width: 18 in. Louver Overall Width: 22 in.